My love for silk as a cover material grows. 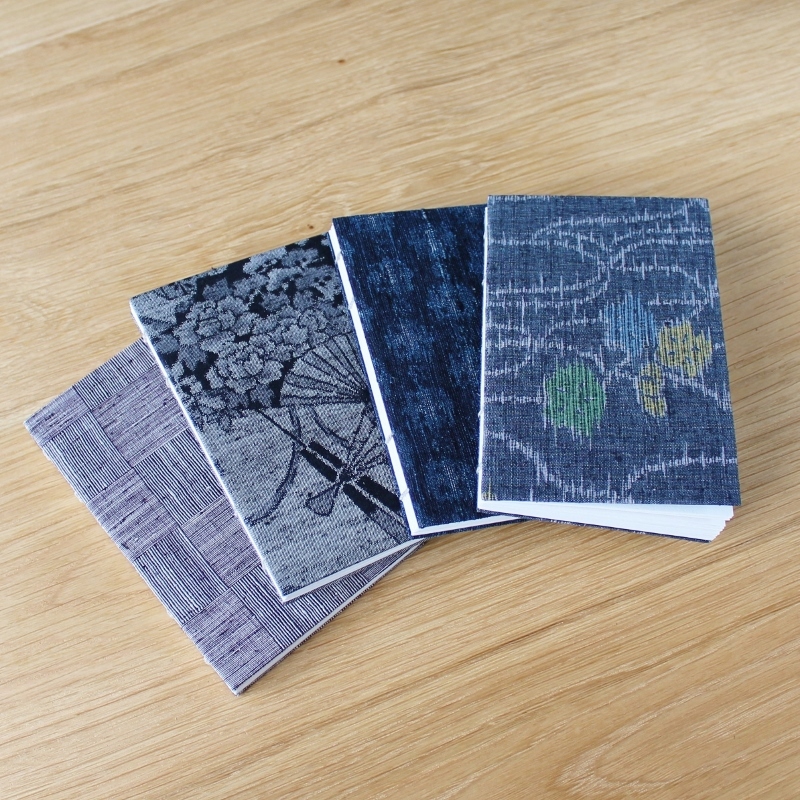 Earlier this year I made a set of sewn boards binding notebooks using some gorgeous vintage kimono silk fabric I received from Eva of Larkspur Studio London (only one of them remains available!). Now it was time to try something different with the samples she sent me, and so this lot of eight soft cover Coptic notebooks was born. I love each and every one of them. 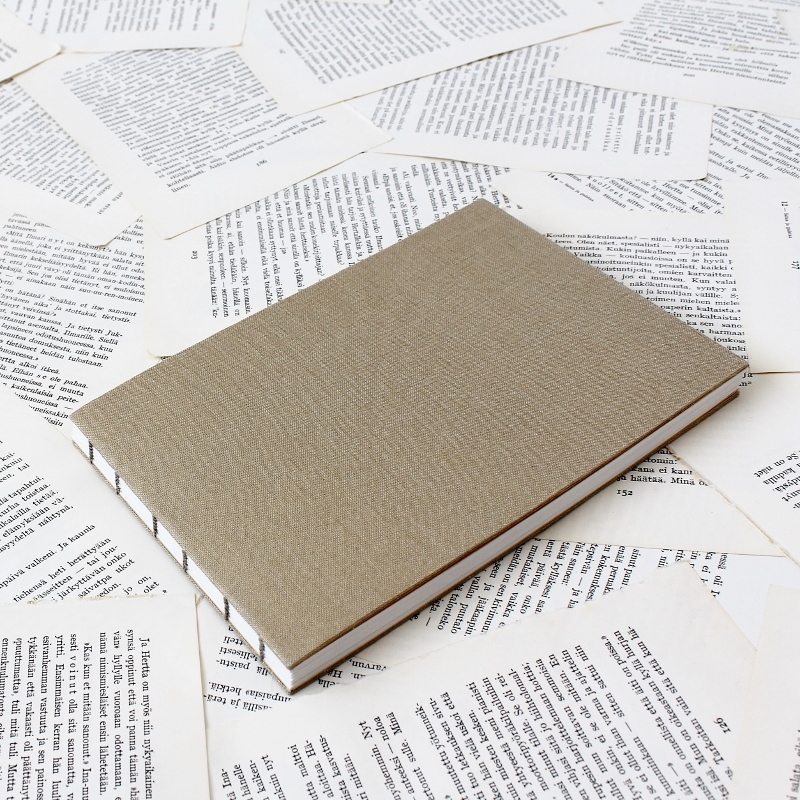 These books measure 9×13,7×1,1cm / 3.4″x5.4″x0.4″ and have 64 pages each. Only one in each design was made and only six are still available as I write this. You can find those six in the Paperiaarre shop. There are some busy times ahead with my poetry book, but luckily I’ve also been a very busy bookbinder lately, so there’ll be new bookish things here in the coming weeks as well! Coptic bound journals, as promised! I was a busy bee for the past week and have a ton of new notebooks under way, with stacks of signatures, endpapers, and fabric taking up most of my desk. I need to turn those stacks into stacks like this one - these take up a lot less space, are easier to store, and are ready to leave the house whenever. 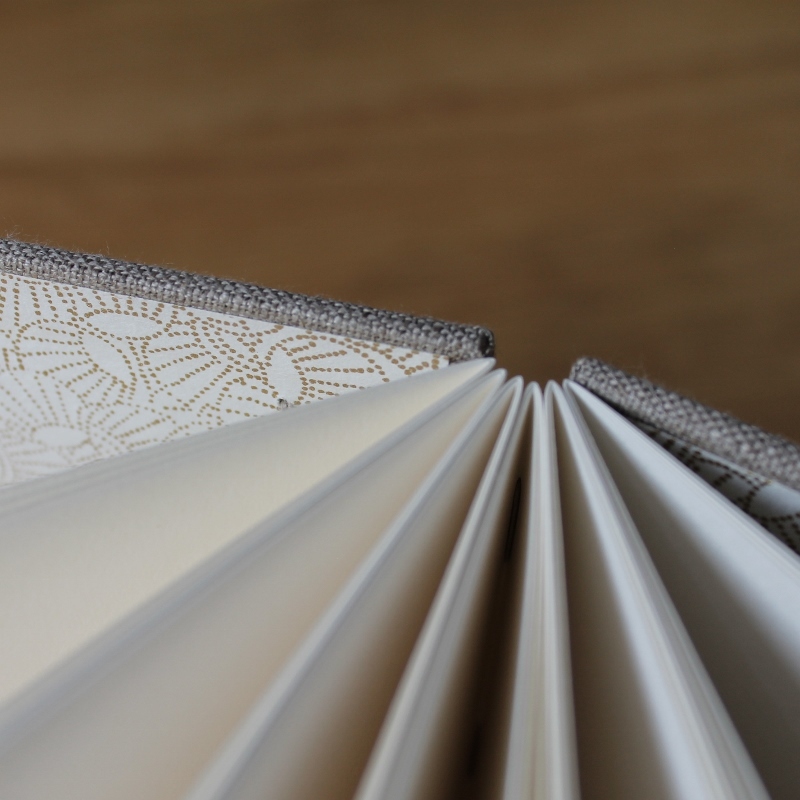 The sage green journal got a distressed gold stripe on its cover to match its dotty gold endpapers, but the other three I left plain apart from the patterned endpapers. 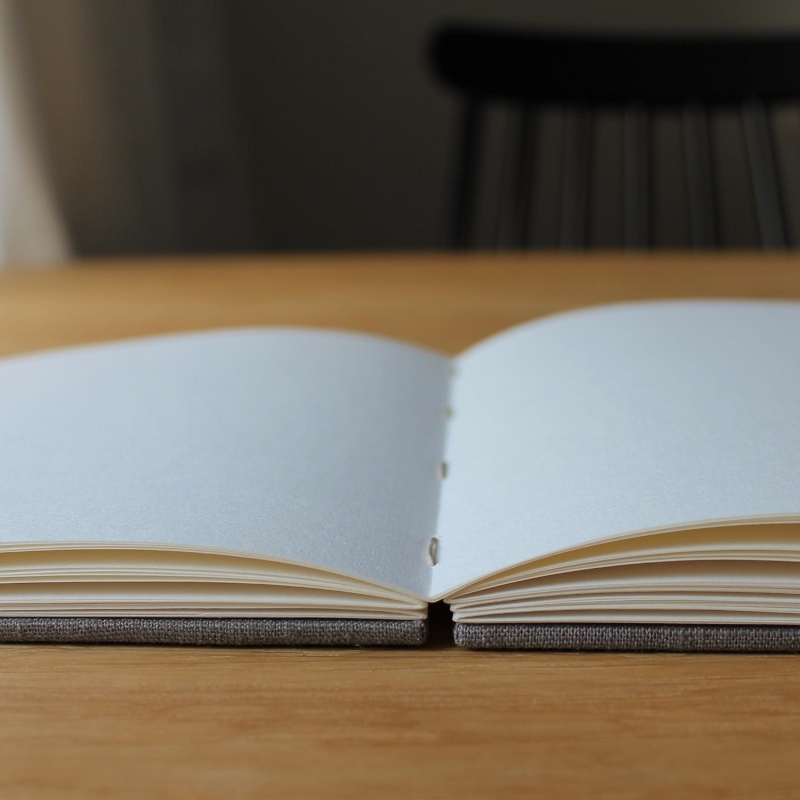 And as always, these journals open beautifully and lie flat just where you want them to. 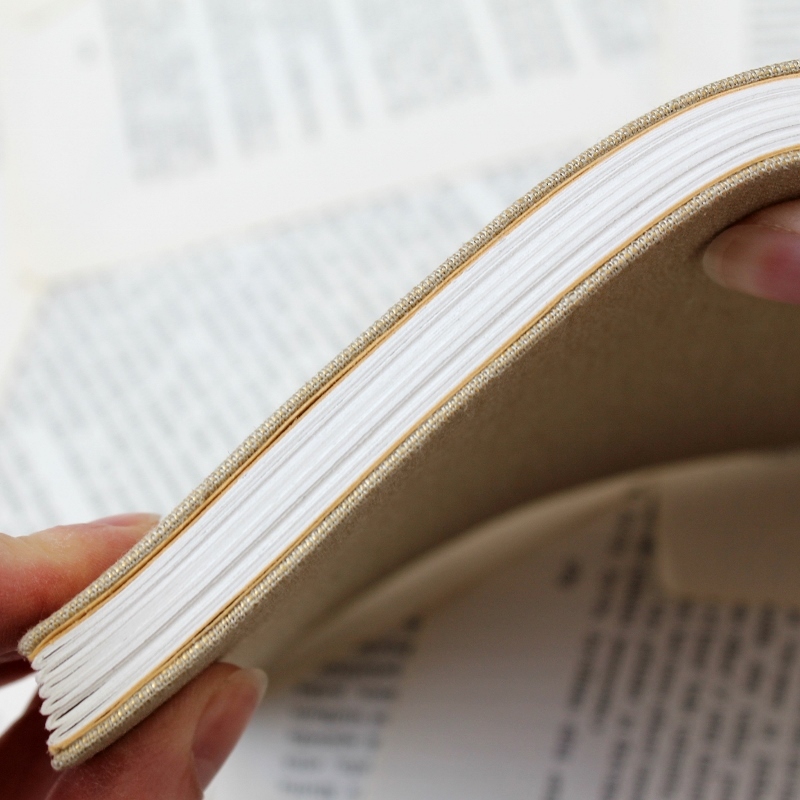 Unlike with many, many books, you can actually use the entire page, from the very edge to the very fold. Now it's time for me to choose between heading out into an actual snow storm in search of sustenance or cutting some book cloth until I'm so hungry I want something I have in my freezer. You all know how this is going to go. I've played with the idea of creating some softcover Coptic bindings this spring, and I wanted to put that idea into action before my summer bookbinding hiatus. And here it is! I made some softcover Coptics while still at school over a decade ago, but they had covers made out of either leather or paper. 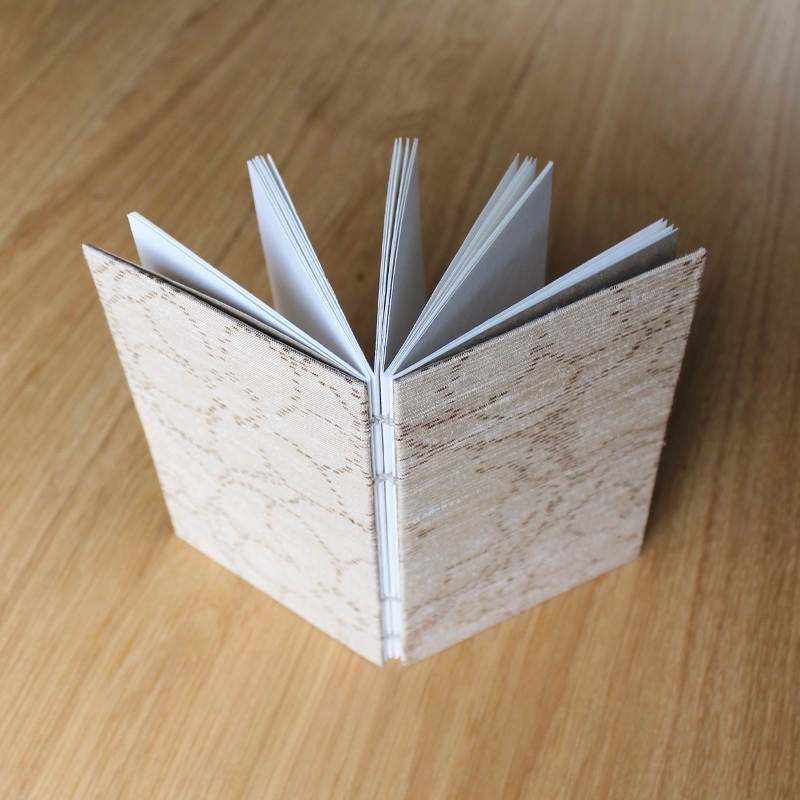 This here with gold linen covers is a mix between the sewn boards binding variation I do and the Coptic binding. The sewn boards bindings do have more rigid covers than this book, but I adapted some structural aspects of the binding to suit my purposes here. I love the lightness that comes with soft covers. 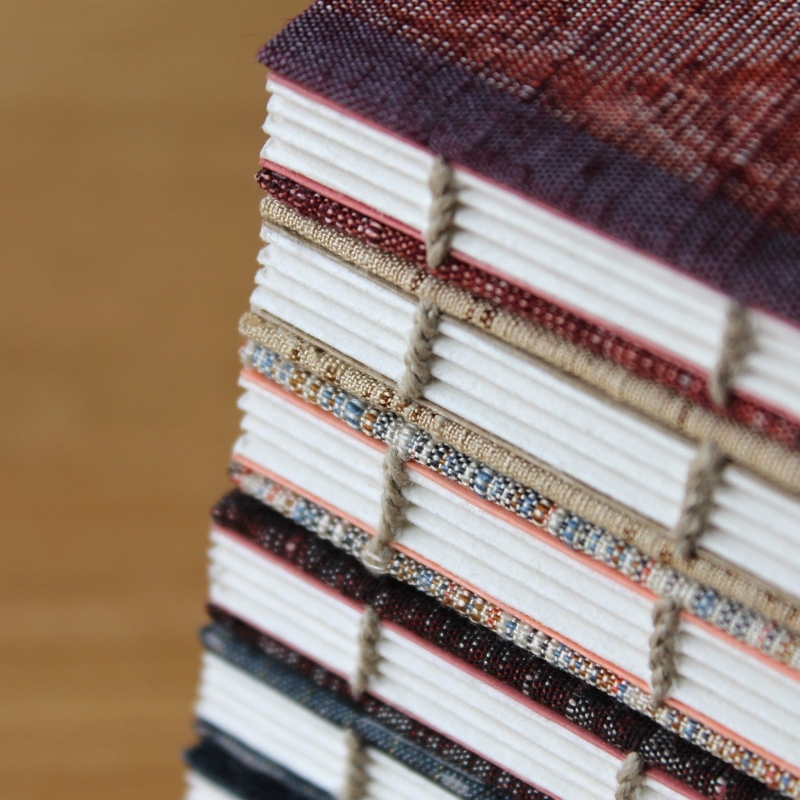 And using luxurious linen results in a softcover book that doesn't look cheap at all. It looks simply lovely. Yet another friendly reminder: This here is the last new book in the shop before September (there'll be more blog posts before I go, though), and I'm going to gradually close down the shop for the summer by the end of May. Items about to expire will expire, and the couple new mixed media things (watch case necklaces and a small collage tin) will be offered for sale on Instagram only. So if you have a wedding coming up and you're in need of a guest book or a gift, or if your bullet journal is nearing its final pages, or if you have a feeling you or someone you know might need a new notebook some time during the summer, or if you have an empty spot on your wall in need of art, now would be a great time to act. Thanks so much for all of your support! Suddenly I'm just trying to tie up loose ends: finish unfinished books, finish tasks with deadlines looming in early May, plan ahead of little collage-y things to make this summer. While other people take a vacation in the summer, or spend as much time as possible at the summer cottage, I'm moving to the big city (Helsinki, that is) for the summer to work on my poetry book. No distractions and a change of scenery is just what the doctor ordered. That means I'll be taking a long break from bookbinding in a mere few week's time. Sorry! I hope you'll stick around to see what I come up with come autumn. My plan is to create small collages or paper art pieces every now and then, created from a small boxful of supplies I'll drag with me to my summer home, so this blog won't end up completely abandoned for the summer. But writing is going to be my priority until September, at least. This isn't a goodbye post - just a friendly public service announcement well ahead of time. I have yet to decide whether to close down the shop for the summer or simply change processing times to 2-3 weeks and ship when I visit home. But if you want to play safe, stock up! Among the unfinished project was this vintage lace guest book that had been waiting for me to put it together for a good while, but all it took was a gloomy snowy day in late April for me to take out the needles and finally sew it. This one's pretty big (16,3x23cm / 6.4"x9.1") and it has 48 pages of 150gsm paper. Perfect wedding guest book material, I'd say. You can find it for sale here. I hope the seasons are treating you better wherever you are. Here the spring has stalled, almost decided not to come at all. Yesterday it snowed a lot again and I had to take out my woolly hat from storage... I'm thankful for the daylight, but I'd prefer if it were not filtered by snow falling down.